We’d love your help. 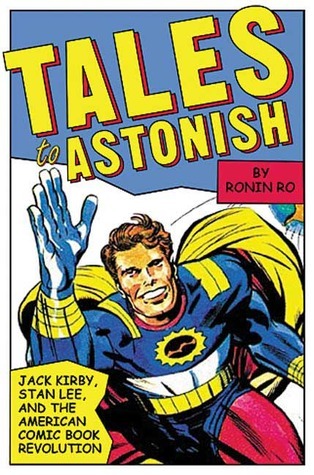 Let us know what’s wrong with this preview of Tales to Astonish by Ronin Ro. 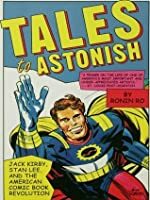 Tales to Astonish relates the spectacular life and times of Jack Kirby, the legendary forefather of American comic books. In the 1960's, Kirby joined with Stan Lee to develop many of our best-known and most beloved superheroes, including the Fantastic Four, the Incredible Hulk, the X-Men, Thor, Iron Man, the Avengers, and the Silver Surfer. Ronin Ro chronicles Kirby's poverty-stricken origins in New York's Lower East Side, his early commercial triumphs and failures, his renowned partnership with Lee, and his revolutionary artistic innovations, tracing the comic book industry from its inauspicious beginnings to its sensational successes. 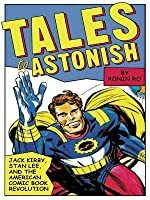 To ask other readers questions about Tales to Astonish, please sign up. Although I'm not a big Marvel fan by any stretch of the imagination I enjoyed this book because it serves as an excellent history of the comics industry. Jack Kirby was a major player in both the Golden Age and Silver Age of comics, creating, writing and even editing many popular titles. When he was finished doing The Fantastic Four he would go to work on The Rawhide Kid (cowboys), True Romance, and Sgt. Fury and His Howling Commandos. I enjoyed a lot of the "behind the scenes" gossip of comics c Although I'm not a big Marvel fan by any stretch of the imagination I enjoyed this book because it serves as an excellent history of the comics industry. Jack Kirby was a major player in both the Golden Age and Silver Age of comics, creating, writing and even editing many popular titles. When he was finished doing The Fantastic Four he would go to work on The Rawhide Kid (cowboys), True Romance, and Sgt. Fury and His Howling Commandos. I enjoyed a lot of the "behind the scenes" gossip of comics creation; there aren't a lot of books out there that accomplish that. I actually enjoyed his work on Mister Miracle, The Demon and The Sandman for DC, so his departure from Marvel wasn't a big tear-jerker for me, but the New Gods with its impossible to follow mythology (even attempted to be explained in this book) was clearly the sign of an old man losing his marbles. It's not so much about the growth of the comic book or the silver age of comics as it's a love letter to Jack Kirby. That could've derailed the book, but Ro did enough reporting and used enough quotes to push the book forward. Plus, I'm a geek. I was gonna enjoy this book no matter what. I just finished reading this book. Now as anyone that has had an even passing conversation with me knows, I am a rabid comics fan. So, I read this book over the last two days and simply marvelled, (pun intended), over how the industry got started and how it treated its creators. In the end, I feel this book was very fair to both Stan Lee and Jack Kirby. But, you just can't help but see how awful big business can be. I feel bad for people like Jim Shooter, who admittedly made Marvel a juggernaut, I just finished reading this book. Now as anyone that has had an even passing conversation with me knows, I am a rabid comics fan. So, I read this book over the last two days and simply marvelled, (pun intended), over how the industry got started and how it treated its creators. In the end, I feel this book was very fair to both Stan Lee and Jack Kirby. But, you just can't help but see how awful big business can be. I feel bad for people like Jim Shooter, who admittedly made Marvel a juggernaut, get the bum rush. Of course, to make Marvel big he had to screw over some people. Bob Kane (Batman), Jerry Seigel and Joe Shuster (Superman) are famous for being screwed out of their rights over their characters. But, they flat out sold their creations. Jack Kirby created Captain America (with Joe Simon), Spider-Man (with Stan Lee and Steve Ditko), The X-men/Thor/Hulk/Iron Man/Black Panther/Silver Surfer...well the list is too long to mention, but all with Stan Lee. Jack had to fight to get anything more than his base salary for these creations. Marvel dealt him a crappy hand and only with the support of a lot of help from 100s of big named creators did he even get some of his original work back (1900 pieces out of 9000 or so). Now as a guy born in the mid 70s. I loved and still love Stan Lee. His was the voice I heard and words I read in comics and cartoons. Jack was never a wordsmith and stayed in the background. It was only later in life that I even realized how amazing he was. My biggest regret in life to this point is never having met the man. Quite an interesting history of the early history of Marvel seen though Stan Lee and Jack Kirby. The starts off with Jack Kirby, his childhood, he meeting and marriage to Roz and his time in the Army during World War Two. We are given a history of Marvel before it became Marvel. We see the creation of the first Marvel hero, Captain America. During this time we meet a young Stan Lee who worked with Kirby. We move into the 60's Stan is given a bit of free reign and between Stan and Kirby they creat Quite an interesting history of the early history of Marvel seen though Stan Lee and Jack Kirby. The starts off with Jack Kirby, his childhood, he meeting and marriage to Roz and his time in the Army during World War Two. We are given a history of Marvel before it became Marvel. We see the creation of the first Marvel hero, Captain America. During this time we meet a young Stan Lee who worked with Kirby. We move into the 60's Stan is given a bit of free reign and between Stan and Kirby they create some of the heroes we know Marvel for today. The Biggest of which is The Fantastic Four. With Kirby's hand in most of the early work at Marvel the company kept most of his original artwork. While he watched his artwork on sale at conventions for high prices he couldn't get them from Marvel. This book was kinda uneven, Stan Lee and Kirby are painted sometimes and nice guys and on the other hand as asses. Stan Lee especially. The story was a bit too broad. We get bits of this history but most was a quick gloss over. I actually liked the book very much. A good book that covers a pivotal period of the industry. The writing is a little dry here, and it seems to rely on interviews with only some of the players. The book frankly makes Jack Kirby look like an angry bitter man and does little to dispute Stan Lee's claims that he wrote much of the material, even though the book seems to point the reader to a conclusion that Kirby was wronged and Lee was as manipulated by the Marvel press machine and reporters' bias' anything. This is history and it's no A good book that covers a pivotal period of the industry. This book is primarily concerned with Kirby and Lee and honestly it vilifies Lee as having made a deal with the devil (it seems) and screwing over Kirby in the process. I am not inclined to disagree with that because Marvel very much did just that to Kirby, singling him out because if anyone had a claim to the characters it was him. The book also touches a bit on Ditko's experience as it is similar to the dealings with Lee. If you read Mark Evanier's "Kirby: The King of Comics," then this is a w This book is primarily concerned with Kirby and Lee and honestly it vilifies Lee as having made a deal with the devil (it seems) and screwing over Kirby in the process. If you read Mark Evanier's "Kirby: The King of Comics," then this is a wonderful companion piece. Tales is about the early history of comic books in America with the emphasis on Marvel, Stan Lee and especially the career of Jack Kirby. As a Marvel monkey during the '70s I found this book both enlightening and sad. Apparently Lee was an unctuous showman and Kirby was chronically frustrated with the sleazy shenanigans perpetuated by Marvel - and to a lesser extent, DC. Tales is also filled with trivia only a comic geek could love. I really wanted to go smack someone at points in this book. Jack was an amazing talent and a sweet man who was often screwed over because he didn't like conflicts. By the end of the book though, I was nearly crying because of the genuine love and admiration so many had for Jack and his wife Roz - not the least of which is the writer. A "warts and all" look at the inside of the industry from its beginnings until Jack's death in 1994 and Roz' in 1996. The story was awesome read it during this past weekend. I was surprised to find no picks. Mark Evanier's on the same subject (Comic artist great Jack Kirby) had more pics and had more of a comic book feel. An interesting look at the world of comoic books. The book focuses on Stan Lee and Jack Kirby, the creators of the Marvel Universe. As a big fan of early Marvel comics through the early 80's, I enjoyed the look behind the scenes. Tales to Astonish is by far my favorite telling of the Lee/Kirby story that I've read thus far. You might be tempted, but don't do it! Not only is this book full of inaccuracies, but it is poorly written. A big disappointment. Avoid it and wait for the Evanier bio. An entertaining look at the Silver Age of comics. Stan Lee is just as insane as you think he is, and the book only gets better from there. After reading this book I have a whole lot less respect for Stan Lee. Kirby is King.Long live the King !